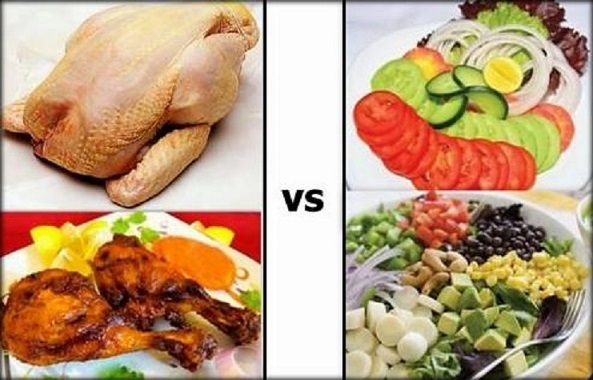 Vegetarians are people who don't eat meat such as beef, pork and fish. Some of them do not eat animal products either. There are several reasons why people do not eat meat; it can be due to religious belief, moral or health reasons. Deciding to be a vegetarian is a choice and it helps to know the facts about it before becoming one. There are also many types of vegetarians like vegan, lacto vegan, pollotarian, semi-vegetarians, pesci-vegetarians. Yes, vegetarians can be healthier but not always. Vegetarian diets are generally low in saturated fat, animal protein and cholesterol but have higher fiber and folate compared to a non-vegetarian diet or ordinary diet. As a result, they are less likely to acquire bone diseases, heart diseases, hypertension, diabetes mellitus, lung cancer, colon cancer and other forms of cancer. In fact, it has been reported that vegetarians live longer in western countries. However, eating habits isn't the only factor working here, the reduced risks and the longer life may also be due to healthy lifestyles vegetarians take. Most vegetarians are seen to exercise routinely, do not smoke and have a healthy weight than those who do not follow a vegetarian diet. Are vegetarians healthier? That depends. Not all vegetarians follow the same diet. Some vegetarians may substitute meat with unhealthy foods high in fat, sugar and calories such as ice cream, high-fat cheeses, potato chips, etc. Poor food substitute can really be detrimental as this may lead to serious illnesses in the long run. Protein deficiency, iron, calcium, zinc and B vitamins especially B12 are all essential to one's health and if you lack one of these vitamins and minerals especially during pregnancy, it may lead to a more serious condition for you and your baby. Vegan type vegetarians who do not eat poultry products need vitamin B 12 supplement. However, excessive dosage of supplement may also cause problems. Therefore, good meal planning is recommended for better physical and mental health. So, before deciding on becoming a vegetarian, seek professional advice first. Overall, vegetarian diet can be considered healthy if it contains essential nutrients. Being a vegetarian decreases the risks of acquiring certain diseases like heart problems, type 2 diabetes and even some forms of cancer. Vegetarian diets just need to be well-planned and followed to make sure that nutrients found in meat and other poultry products are replaced with nutrient rich food substitute. Calcium helps keep our teeth and bones strong and healthy. The best sources are milk and dairy products. But if you don't consume them, go for other sources such as plant and calcium-fortified products. These include dark green vegetables such as turnip, kale, broccoli andcollard greens. You may also include soy milk, soy yogurt, cereal, tofu and fresh fruit juice to substitute meal products. Just like calcium, vitamin D helps nourish our bones and teeth. Check the food label to make sure that vitamin D is added to your cow's milk, soy, cereals and margarine. You need to have fortified foods and enough sunshine to get enough vitamin D. If not, take some supplements in case of deficiency. Protein rich food like eggs and cheese are necessary to keep your skin healthy. It also keeps the muscle, bone and other internal organs stronger. You can get enough protein by eating plant based products such as legumes, soy, lentils, nuts, beans, whole grains, seeds, and oats and whey. Iron plays a significant role in our body. It's part of our cells and help carry oxygen from the lungs to different parts of the body. Iron from plants is not easily absorbed by the body, which is why vegetarians are recommended to have double amount of iron in the diet compared to non-vegetarians. Food like strawberries, tomato, broccoli and vitamin C help absorb iron. Food like lentils, lentils, cereals, whole grain and green leafy vegetables are great sources for iron. Zinc plays a significant role in cell division. If you are a vegetarian who eat dairy products, cheese is a very good option to eat to get enough zinc. Plants sources are whole grains, legumes, nuts and almonds, wheat germ, soy products and many more. However, zinc derived from pant sources are not easily absorbed by the body. Vitamin B12 is essential for the brain and nervous system to function well. However, this type of vitamin can only be found in animal products. For vegans, fortified food with vitamin B12 like yeast flakes, soy milk and cereals is necessary. Some sources of B12 are cow's milk and eggs. To make sure you have enough B12, taking vitamin B12 may be necessary. Are vegetarians healthier? Whether you consume enough omega-2 fatty acids is essential to maintain your health. For vegans, this can be acquired from various sources like flaxseed, canola oil, soybeans, and tofu. Omega 3 fatty acid is essential to help prevent any type of inflammation and prevent certain diseases like heartdisease. Iodine is a type of mineral that helps in the metabolism of your body. Vegans are at greater risk of iodine deficiency, or worse, goiter. And take note that some foods such as cruciferous vegetables, soybeans and sweet potatoes could promote a goiter. The good news is that only 1/4 tsp. of iodized salt daily would help to solve the problem. This is a macronutrient that provides energy and vitamins necessary for the brain and muscles to work properly. Whole grain products are good source of carbohydrates. Vegetarians need a variety of grains such as whole wheat, pasta, brown rice, quinoa and oats to have enough fiber and vitamins. To maintain your health, fat is required. Fat is necessary for the absorption of the different types of vitamins. And it provides fatty acids. Avocado, butter and nuts are good sources of fat. Why Do People Ignore Me? What Does PRN Stand For?